I’ve come across several hand-painted chevron rug designs lately. I love how such a simple, bold design can completely transform the look of a rug. Fantastic, right? Those last two both used inexpensive flatwoven rugs from Ikea. 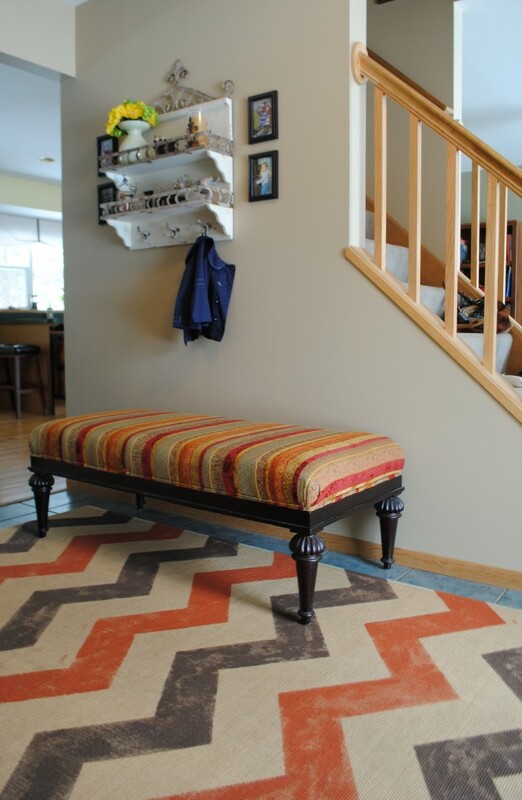 I DO love a chevron pattern just about anywhere…on a wall, a piece of furniture, a rug. But I think for my little kitchen, it might look too busy, especially with all of the colors I want to use. So, for me, stripes it is. Would You Like To Peek Inside My Drawers? 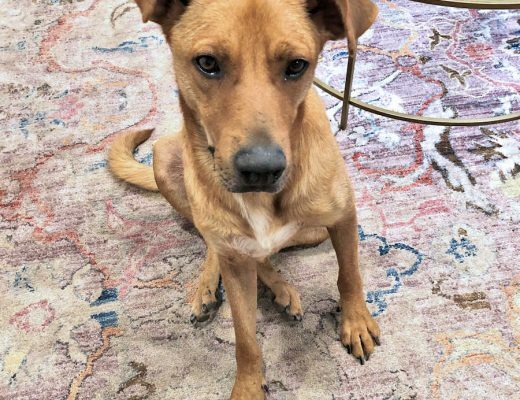 Thanks for showing Jenna's painted rug. 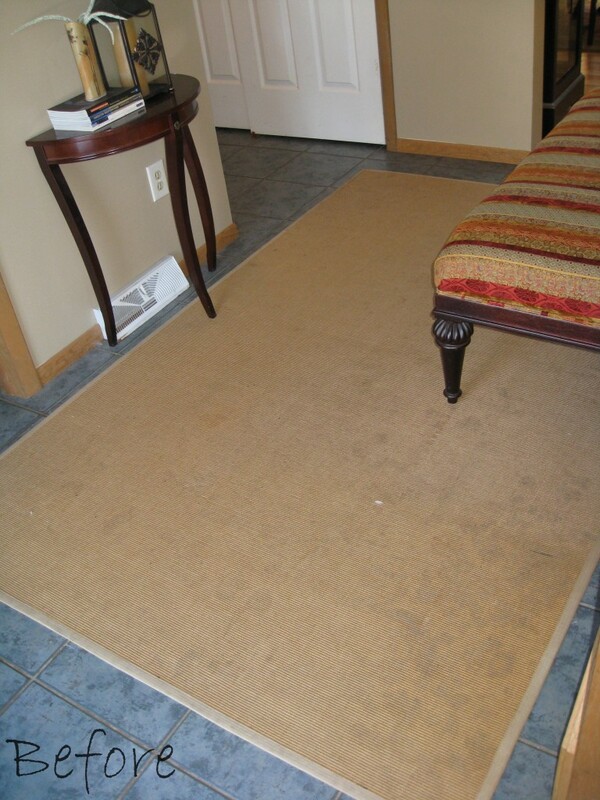 I think that all of us have a slightly worn rug made of carpet that we might be tired of. Don't spend money to replace it. Just turn it upside down and paint it! I LOVE that idea….so cool!! I think my husband might hate you for posting this….I just might have to try this out!! haha! That purple one is gorgeous!!! Definitely seems to need a big space to fit in, you're right! 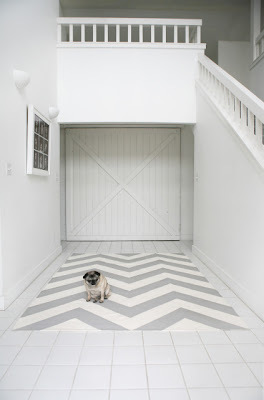 Love the chevron rugs, I too love it about anywhere though. I also love a good dose of stripes, can't wait to see your's when it is finished. I love the chevron, but I agree that the stripes will work better in your space. Can't wait to see the finished product! What material did you decide to use? My friend who does floor cloths uses canvas, and I love them, but they tend to get 'crackly and curled'. Hope you've found another way to do it…. Carol-Anne, I actually decided to use a remnant piece of vinyl flooring that I bought at Home Depot. I think stripes IS the best option…..can't wait to see it. Your right with the stripes in my opinion. I usually find my first instincts best. LOVE the idea all the same! I am a decorative artist in the Seattle area specializing in custom hand painted canvas furnishings such as floorcloths (canvas art rugs), wall hangings and table linens.